"Class act auto place!! Marc is the MAN!!" I was directed to them by a friend. I could not have been more pleased with their attitude and work. I would definitely go back to them again. Class act auto place!! Marc is the MAN!! It worked well. They were very pleasant. As far as I know they did a good job. It was in and out. They did it quickly. It was same day service. Excellent work. Customer service great. He is very accommodating. I am going to take it back over there. It is a very comfortable and pleasant atmosphere when I go over there. They are very good workers. Since I bought my car, I haven't had any problems. I think they are very good. They were very helpful and took care of my car. Good, honest and fast service. They just basically took good care of a computer problem that I had. They did a good job by me. The service was quick and efficient. The employees were very friendly and courteous. I would definitely recommend them and I will definitely go back. Quick service, straightforward, thoroughly explains the work they're doing &amp; friendly. They are very courteous. They do a great job. I am very happy with the service. I would recommend anybody to go to them. They are terrific people. They are timely in what they do. I have never had a problem. Work was done to fix a check engine light. When I picked up the car the light came back on and they took the car in immediately to check again - the fuel line, smoke test, etc. Mark and his team treat customers the way I'm sure they would like to be treated. I didn't feel like they overcharged me. They fixed it quickly on a holiday weekend. 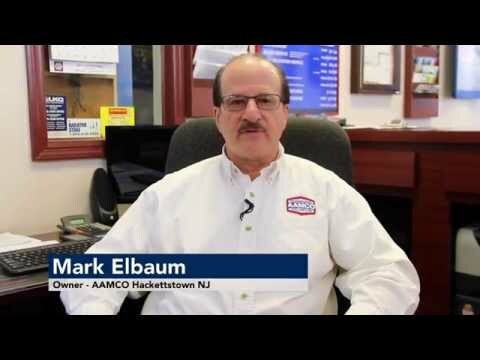 AAMCO of Hackettstown was established back in 1986 and has been providing the local community with quality automotive repair ever since. This RepairPal Certified shop features an experienced and well-trained team led by an ASE certified Master Technician. Repairs performed here can range from transmission and driveline diagnoses and repair, to minor and major mechanical repairs, to state smog inspections, to check engine light and computer diagnosis and repairs, as well as your scheduled maintenance needs. All this work is backed by a 12-month / 12,000-mile warranty for your peace of mind. Our survey of their recent customers revealed a group who describe the team here as “courteous”, “knowledgeable”, “professional”, “helpful”, and "honest". A local shuttle service, rental cars, early bird drop-off, Saturday business hours, and a waiting area with wireless Internet are also available fro your convenience. Most car owners are familiar with AAMCO transmission repair and maintenance, but AAMCO’s services go far beyond transmissions. Whether you’re having trouble with your battery, or need your air conditioning serviced, take your car to the dealer you can trust for professional repairs and unmatched customer service. Over the past 50 years, AAMCO has serviced millions of vehicles, earning them a reputation as one of the industry’s best in transmission repair and total car care.